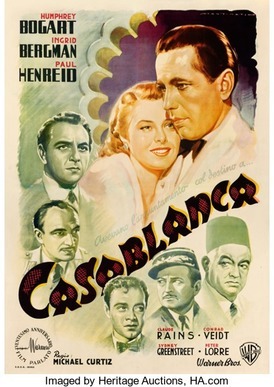 “` A truly special promo piece, the 1946 Casablanca poster (Italian 4 Fogli with Luigi Marinati artwork) has sold for $478,000 in Dallas at a public auction of vintage movie posters. It is the only known surviving Italian issue poster. “`Heritage Auctions estimates the price tied the record of the payment for any film poster at a public auction. This 1946 Italian poster measures 55.5 inches x 78.25 inches. The current buyer chose to stay anonymous. It was owned by a collector living in London. “`The price equals the record amount paid in 2014 of a poster for London After Midnight, a 1927 silent movie, starring Lon Chaney. Other posters auctioned this weekend included works promoting Frankenstein, The Bride of Frankenstein, Metropolis, Cavalcade, Morocco, and The Day the Earth Stood Still. 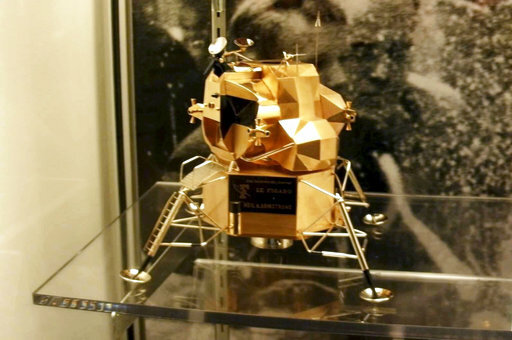 “`Ohio authorities have reported that a gold replica of the historic lunar space module has been taken from the Armstrong Air and Space Museum. Several copies of the excursion module, created by Cartier, were given to astronauts – Neil Armstrong, Buzz Aldrin and Michael Collins – shortly after the 1969 historic space mission in Paris. Armstrong was the initial human to step onto the moon’s surface. “`Police say the value of the replica cannot be determined. The FBI and Ohio Bureau of Criminal Investigation are investigating the theft. “`Armstrong died in 2012 at the age of 82. This entry was posted on Sunday, July 30th, 2017 at 9:23 pm	and is filed under Blog by Manny Pacheco. You can follow any comments to this post through the RSS 2.0 feed. Responses are currently closed, but you can trackback from your own site.